Jyoti (Jody Kessler) has been practicing yoga for over 30 years, and she is a certified Kripalu Yoga Teacher. She is also a performing songwriter and recording artist, a leader of devotional and ecstatic chant, and an ordained Interfaith Minister. A former schoolteacher, she holds a Master’s Degree in Education. Jyoti has led transformational workshops in spirituality and music at retreat centers and faith communities, and has been on faculty at the Omega Institute in Rhinebeck, NY. She regularly leads Kirtan and devotional chanting from many traditions with her band, ONE LOVE. Jyoti weaves together her gifts as a motivational speaker, teacher, troubadour, and yogini to create a truly unique yoga class that includes chanting and song, poetry, pranayama, asana, guided meditation, deep relaxation, and more. She invites you to join her for an uplifting and inspiring body/mind/spirit experience. The turning of the year is a perfect opportunity to start anew, to say YES to yourself and your yoga practice, whether it’s coming to class for the first time, or rekindling the fire of a practice that has lapsed. In yoga, there is a Sanskrit name for that fire of spiritual discipline–it’s called Tapas, and is sometimes referred to as “burning enthusiasm”! For those of you who are ready to fire up that enthusiasm on New Year’s Day, I’m happy to say that there WILL be a class in the morning of January 1st at Island Fitness Community Corners, 10:30 AM! And, I will also be teaching the evening class at the downtown studio at 6:45 PM. We’ll invoke Ganesha, the Lord of New Beginnings and the Remover of Obstacles, so our paths can be cleared for us to move forward into 2109 with intention and joy. I will once again be offering Saturday morning classes at the The Temple of Joy Yoga Sanctuary starting on January 5th, continuing through February. In March I will be taking a break from teaching, as I will be going to India for a three-week pilgrimage to the foothills of the Himalayas! So let’s bring our burning enthusiasm together to warm these winter days in a shared exploration of the transformative power of yoga. Also new for 2019: Our local community kirtan gatherings will be held twice per month, with a new alternating schedule. Kirtan will be led by One Love on the first Thursday of each month at the Temple of Joy, and By Damodar Das on the third Friday at the Foundation of Light. See below for details of this month’s offerings. 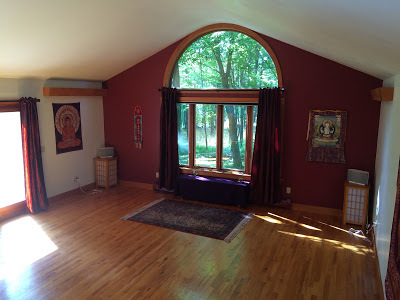 There will be some changes in fees and policies for 2019 at the Temple of Joy Yoga Sanctuary. There will be a modest increase in class fees, but all classes will now be 90 minutes long. Also, class cards will be extended to 4 months to give you ample time to use them up before expiration. I look forward to practicing with you in the new year! Back by popular demand, Will Fudeman will once again be offering his Chi Gong workshop at the Temple of Joy on January 5th, from 1:30 -3 PM. See below for details and registration information. the earth, the atmosphere and the heavens. and our unity with All That Is. By this knowledge may our actions be inspired. Listening to the Gayatri Mantra while performing sun salutations (facing east in the morning) is a powerful way to integrate sound and movement in our honoring of the sun. Our asana practice is also an opportunity to discover our own radiance, as breath and movement allow the chattering mind to drop into stillness. We begin to touch into That which is moving us, breathing us, illuminating us, and shimmering in each particle of our being. May you enjoy that exploration and feel the glow!